The conservation of Mayan wall paintings at the archaeological site of Calakmul (Mexico) will be one on the subjects touched upon by Piero Baglioni (based at the University of Florence) in his invited lecture at the 3rd European Chemistry Congress in Nürnberg in September. In a special issue of Chemistry-A European Journal, which contains papers by many of the speakers at this conference, he reports on the latest developments on the use of humble calcium and barium hydroxides nanoparticles as a versatile and highly efficient tool to combat the main degradation processes that affect wall paintings. La Antigua Ciudad Maya de Calakmul is located in the Campeche state (Mexico) and is one of the most important cities of the Classic Maya period (AD 250-800). The excavation of this site (set up in 1993) involves, under the supervision of the archaeologist Ramon Carrasco, archaeologists, architects, engineers, conservators and epigraphists, besides other specialists. Since 2004, the Center for Colloid and Surface Science (CSGI) at the University of Florence (CSGI), and currently directed by Piero Baglioni, has been an active partner, being involved in the study of the painting technique and in the development of nanotechnology for the consolidation and protection of the wall paintings and limestone. Over the last decades, polymers, mainly acrylic and vinyl resins, have been widely used to consolidate wall paintings and to confer protection and hydrorepellency to the painted layer. However, contrary to the expectations, polymers used for the protection of wall paintings have induced further degradation of the works of art and their chemical modifications, such as cross-linking, strongly hampers their removal. Hence, there has been a need to develop new methods of conservation. In Florence, Piero Baglioni and his group have pioneered the use of calcium hydroxide nanoparticles to restore wall paintings, the degradation of which is basically due to the transformation of calcium carbonate into gypsum. Nanoparticles of calcium hydroxide efficiently interact with carbon dioxide to reform calcium carbonate and replace the degraded original ligand, leading to the re-cohesion of the paint layer. However, when large amounts of soluble sulfates (i.e., sodium or magnesium sulfates) are present in a wall painting, consolidation with calcium hydroxide nanoparticles might not produce durable results. In fact, sulfate ions can react with calcium hydroxide to give a double-exchange reaction, producing the slightly soluble gypsum (calcium sulfate dihydrate). Barium hydroxide nanoparticles represent a really useful alternative and a complementary tool to hinder this process. Hence, mixed formulations can be used for the pre-consolidation of surfaces largely contaminated by sulfates. 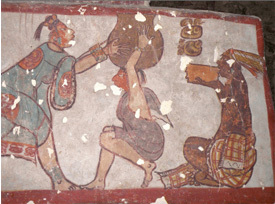 In Calakmul, Mayan paintings have been successfully treated by using a mixture of calcium and barium hydroxide nanoparticles as a dispersion in 1-propanol. The consolidation effect was significant already after one week. The result of the application is that the paintings are now stable and do not show ongoing degradation processes. Thus, nanoscience has opened up enormous potential for Cultural Heritage conservation, due to the unique properties that the reduction in particle size confers to nanomaterials compared to their micrometric counterparts.